Los Angeles Studio Conversations marks the fourth Volume of an ongoing interview series conducted by art historian Stephanie Buhmann, which originated in 2013. With seventy conversations published to date, it aims to provide a permanent and growing forum for some of the inspiring female artists working today. Like its predecessors, New York Studio Conversations (2016), Berlin Studio Conversations (2017), and New York Studio Conversations II (2018), this book offers an intimate glimpse of the creative process while keeping an eye on diversity. The fifteen artists featured here, work in a variety of media, ranging from film, photography, painting, sculpture, installation, and performance to drawing. In addition, they herald from different generations and represent various levels of renown. While some of them work primarily in the United States, most have shown internationally for a considerable amount of time. All of them have experienced different stages in their careers and have one immediate thing in common: they currently choose to live and work in Los Angeles. By speaking with the artists about particular groups of work, characteristic approaches, personal philosophies, and political engagement, among others, Buhmann explores the many challenges and faceted lines of thought that go into the making of art. As the discussion of the commercial value of art increases, largely due to ever-soaring auction records and the wide media coverage these receive, this interview series serves as a reminder that most art starts as a private contemplation in the isolation of the artist’s studio. 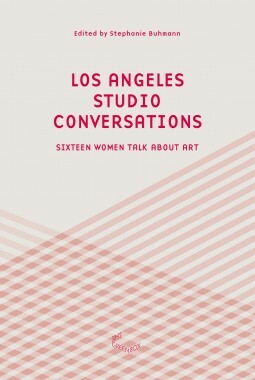 Los Angeles Studio Conversations introduces the following artists: Lita Albuquerque, Sarah Cain, Andrea Fraser, Liza Lou, Shana Lutker, Kristen Morgin, Catherine Opie, Silke Otto-Knapp, Monique Prieto, Alison Saar, Analia Saban, Fran Siegel, Lisa C. Soto, Despina Stokou, and Diana Thater.